Pete was born in West London and became interested in writing at an early age. He began writing plays after success as the drummer in the punk group The Lurkers. An early work, Thank Your Lucky Stars, was performed at the Edinburgh Fringe, running for three weeks to excellent reviews and he has recently had a short play produced at The Bush Theatre in London. The controversial new thriller from Pete Haynes. Described as an 'American Psycho' for Northern Ireland. Set in Belfast after the signing of the Good Friday Agreement in 2000. 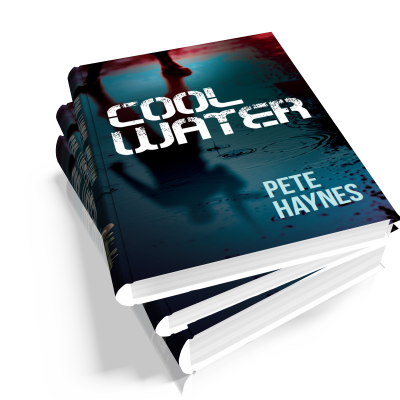 Cool Water is the story of the inter-twined relationship between the establishment and street criminals during this period. Donny Campbell is an infamous paramilitary figure, who is a reflection of a violent society. He is sexually repressed and vents his anger and sexual frustration in a cocktail of violence and warped depravity, ultimately hidden in a world where murder and immorality is almost a part of the norm. Donny finds a kindred spirit in Lord Roddy Harding, a man working in the highest echelons of Ulster and London society. Their relationship fractures when Donny becomes a liability as he becomes increasingly unstable and reckless. Harding through the guise of the British state despatches one of its prolific foot soldiers to kill Campbell and maintain a fragile peace through an assassination that will save his reputation and that of the Government.